FHWA's RSPCB Peer-to-Peer Program (P2P) supports and sponsors peer exchanges and workshops hosted by agencies. FHWA's Office of Safety sponsors P2P events. Local and regional governments have important roles to play in identifying and addressing safety issues on roadways within their jurisdictions. Congress recognized this need and passed legislation in 1998 requiring safety consideration in transportation plans at the local, regional, and State levels. Efforts have since been underway to increase the explicit consideration of safety in these planning processes. More recently, the focus has shifted to improving the linkage between Strategic Highway Safety Plans (SHSPs) and transportation planning documents, notably Statewide and Metropolitan Long Range Transportation Plans (LRTPs), which are required to consider strategies and services to improve the safety of the transportation system. In addition to these plans, States, Metropolitan Planning Organizations (MPOs) and local agencies typically develop other important transportation planning documents (e.g., corridor, bicycle, freight, transit plans) that frequently include safety elements. Improving the coordination and linkages of the safety elements and priorities among these planning processes supports a comprehensive and holistic approach to transportation safety planning. It also provides additional opportunities to implement safety programs addressing key priorities throughout the State. This report provides a summary of the proceedings of the “Coordinating State and Regional Transportation Safety Planning through the SHSP Process” Peer Exchange held in New Orleans, Louisiana on May 22 and 23, 2013. The Federal Highway Administration (FHWA) sponsored the Peer Exchange in coordination with Louisiana Department of Transportation and Development (LA DOTD). The purpose of the Peer Exchange was to explore specific strategies the peer States could adopt to improve the coordination of regional and statewide safety planning efforts. Representatives from Louisiana, Nevada and Utah participated in the event (see Appendix A for the full list of participants). A brief description of the peer exchange proceedings is provided below. LA DOTD has a number of initiatives underway to further reduce traffic fatalities by improving the coordination of transportation planning. For example, LA DOTD has hosted safety planning boot camps to ensure that regional and local stakeholders are involved early in the planning process when major decisions are made about priorities and funding. In addition, LA DOTD has supported the formation of Regional Safety Alliances that are responsible for developing Regional Safety Plans with the goal of involving all the regions in Louisiana in the safety planning process. The Program Delivery Team Leader for the FHWA Louisiana Division office echoed the Assistant Secretary's remarks, noting that a culture that values safety and interagency coordination is critical to achieving a goal of “Zero Deaths.” She suggested that peer exchanges such as this one help to foster a collaborative safety culture and facilitate the transfer of effective safety practices. The SHSP Program Manager from FHWA Office of Safety also welcomed participants and set the stage for the presentations and discussions to come. She noted that all of the States at the peer exchange have a common goal of “Zero Deaths.” Safety professionals understand that to achieve this goal they need to coordinate with stakeholders across their respective States to set common goals and collectively implement appropriate strategies. The goal of the peer exchange is to focus on how to coordinate safety planning and link the SHSP process to the regional planning process. SHSPs are the umbrella plan for the State. They consider the needs of all public roads and help to drive safety investment decisions. The safety goals, strategies and metrics established through the regional planning process—the LRTPs, Transportation Improvement Programs and other regional safety plans—should contribute to and draw from the SHSP. The SHSP process can help to connect planning processes as they pertain to safety by: increasing collaboration and communication; helping to leverage partnerships; and ensuring that there is a data-driven approach to understanding regional and statewide safety issues. This refers to collaboration among State and regional safety partners to link emphasis areas, goals, and objectives in the SHSP to the safety elements within regional planning documents. State, regional and local plans can support common goals and priorities. State DOTs can engage MPOs in SHSP emphasis area teams and the development of the SHSP so that MPOs may, in turn, incorporate relevant goals, objectives and strategies from the SHSP into regional plans. The goal of coordinated performance measurement is to have complementary statewide and regional performance measures that result in aligned strategies, programs and projects to reduce fatal and serious injury crashes. Goals and strategies in state and regional transportation plans should be based on the same data and address the most critical safety issues. Often State DOTs have more robust capabilities than regional and local governments. By sharing data and providing analysis services, State DOTs can help to ensure that regional safety goals and strategies are based on the same data. State DOTs and MPOs can apply similar processes and criteria to select projects. This is facilitated when States and regions have the same goals. MPOs can screen projects based on SHSP and regional safety priorities. States can work with MPOs to communicate the selection criteria for HSIP funding. It is important to measure progress along the way. State DOTs and their safety partners can collaborate to monitor fatalities and serious injuries at the regional level. The three States participating in the peer exchange are all at different stages regarding coordination safety planning. Peers were asked to provide an overview of their efforts. Highlights from the presentations are summarized below. Regional Safety Alliances are developing and implementing regional safety plans and tracking progress. Regional Safety Plans and associated action plans guide the implementation of SHSP strategies. LTAP administers HSIP funds set-aside for local projects. Louisiana has developed a strategic, multidisciplinary, and data-driven SHSP in coordination with a number of partners, including the president of the committee representing MPOs. An update of the SHSP was completed in October 2011. The SHSP includes emphasis areas, objectives, strategies and actions. To develop the SHSP, LA DOTD reviewed data on contributing crash factors. The initial SHSP had 11 emphasis areas. These were too many and not strategic enough. In the update, Louisiana identified fewer emphasis areas: infrastructure and operations; alcohol; occupant protection; young drivers; aggressive driving; and distracted driving. The measurable goal of the SHSP is to reduce the 3-year rolling average of traffic fatalities by 50 percent by 2030. Louisiana DOTD works closely with the Louisiana Local Technical Assistance Program (LTAP) to administer HSIP funds and establish regional safety alliances. The LTAP has established an application process for local agencies to compete for HSIP funds set-aside to local governments. Louisiana DOTD and LTAP are also trying to establish regional safety alliances that will be responsible for establishing data-driven, regional safety plans that are linked to the SHSP. LA DOTD provides leadership, funding and technical assistance to develop the plans, which set regional goals and identify regional emphasis areas based on the data. HSIP funding will be used to fund implementation of regional plans. Four Regional Safety Alliances have been established in Louisiana: North Shore, South Central, Acadia, and New Orleans. The South Central Regional Safety Alliance has adopted a final regional safety plan; other Regional Safety Alliances are developing their plans. The South Central regional safety plan identifies emphasis areas, sets regional goals for fatalities, and includes action plans for each emphasis area. Some strategies mirror the SHSP, while other strategies are specific to the region. The Alliance is working with LA DOTD to track the implementation of the emphasis areas. Some Regional Safety Plans will have emphasis areas that are not included in the SHSP. New Orleans, for example, will have a bicycle/pedestrian emphasis area. New Orleans was identified as a Pedestrian Safety Focus City by FHWA and received technical assistance from FHWA to develop an action plan for Bicycle/Pedestrian issues. Since 2005, the Regional Planning Commission has worked closely with a bicycle/pedestrian stakeholder group to address bicycle/pedestrian safety issues. They have sponsored public awareness campaigns and conducted training courses on the design of bicycle and pedestrian facilities for State and county engineers. LA DOTD believes the key to implementing SHSP is at the local level. The challenges for Louisiana are linking the SHSP to the MPO planning process, bringing all 4Es (Engineering, Enforcement, Education, and Emergency Services) to the table, and keeping local stakeholders engaged. Towards Zero Death (TZD) goal is driving major cultural change. UDOT is reaching out to MPOs to raise safety awareness and coordinate efforts. UDOT is developing “Risk Maps” for all State-owned road segments. Efforts underway to expand to Federal-aid roads and MPOs. Over the past decade, Utah has experienced a growth in population and Vehicle Miles Traveled, while traffic fatalities have declined. Utah DOT has addressed many of the “low hanging fruit” to improve traffic safety; what is needed now is a more focused approach to achieve the goal of zero deaths. Since 2000, UDOT has experienced an average annual decline in traffic fatalities of 4.3 percent. At this rate, Utah will achieve zero deaths by 2036. State-maintained roads make up 13 percent of the total road mileage in Utah and account for 63 percent of the crashes. Only one percent of crashes in Utah are on local and rural roads. Roadway departure is the most common crash type, however behavioral issues—drunk driving, distracted driving, drowsy driving, aggressive driving, speeding, and a lack of seatbelt use—drive fatality numbers. Utah has a Unified Transportation Plan that unifies the State and MPO long range plans. Utah DOT and the MPOs are working to update the state and regional LRTPs to focus on a more comprehensive and serious approach to safety. The fourth goal of Utah's State LRTP is Zero Fatalities. This goal is driving a major cultural change in Utah. Because there has been success reducing fatalities, more people are starting to believe that the zero deaths goal is achievable. UDOT has rallied around idea of Zero Fatalities, but a more consistent approach to safety across the State is still needed. UDOT's goal is to have one approach to improve traffic safety. Nevada is improving the linkage between MPO regional plans and the SHSP. Nevada has formed a strategic communications alliance to coordinate and streamline public safety messages. Nevada updated its SHSP in 2010 and established the goal of “Zero Fatalities.” Like Utah, the population in Nevada is growing and traffic fatalities are decreasing, although the rate of decrease has tapered off. Similar to Utah, approximately 70 percent of crashes in Nevada take place on State roads. 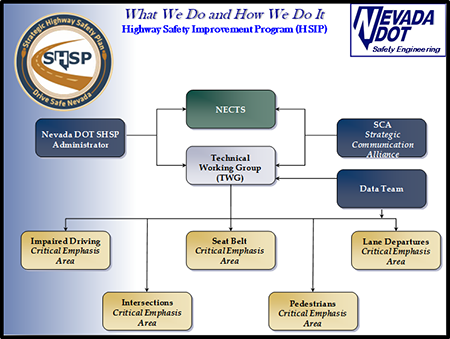 Nevada established a Nevada Executive Committee on Traffic Safety (NECTS) that leads the SHSP effort. There are two MPOs in Nevada: the Regional Transportation Commission of Southern Nevada and the Washoe County Regional Transportation Commission; they both participate on NECTS. Nevada's SHSP has five emphasis areas: Pedestrians; Impaired Driving; Occupant Protection; Lane Departures; and Intersections. Nevada established a technical working group and emphasis area teams to lead the implementation of SHSP strategies. In addition, Nevada formed a Strategic Communications Alliance to coordinate and streamline public information to avoid sending competing messages to the public. The three key players on the Strategic Communication Alliance are Nevada DOT, Nevada Department of Public Safety, and University of Las Vegas. Finally, Nevada has established a data team to: improve crash data; provide MPOs access to crash data; and improve electronic crash data reporting. The South Central Regional Louisiana Alliance has adopted a regional version of the State's SHSP with the same emphasis areas as the State SHSP. Mini grants awarded to support local engagement. Alliance conducts safety awareness campaigns and local road safety assessments. Nevada Executive Committee for Traffic Safety (NECTS) coordinates safety goals and priorities. NECTS includes representatives from a number of State agencies, as well as the two major RPOs in Nevada, FHWA, and FMCSA. Peers from the participating States were invited to highlight some of their successes coordinating regional and statewide safety efforts. They were asked to focus on the areas of Stakeholder Collaboration, Goal and Objective Setting, Performance Measurement, Data Analysis, Safety Project Selection and Monitoring and Evaluation. Peers from Louisiana and Nevada shared how regional alliances and an executive committee on traffic safety help them achieve stakeholder coordination. The South Central Louisiana Regional Alliance is a multidisciplinary team of 35 member agencies, primarily from law enforcement, that meets quarterly. The alliance works collaboratively and proactively to address transportation safety issues. With the help of Louisiana DOTD and LTAP, the alliance has adopted a Regional Safety Plan which is aligned to the SHSP. The alliance has appointed team leaders to lead the implementation of action plans for each emphasis area. The alliance is also working with the Louisiana LTAP to improve access to and analysis of crash data. To support local engagement, the alliance administers a mini-grant process for safety projects and equipment. The alliance also conducts local outreach and marketing campaigns that engage citizens in safety efforts and raise safety awareness. The alliance has conducted four local road safety assessments (RSA) in an effort to engage local public works and engineering staff. Shares progress on safety initiatives. NECTS includes representatives from the SHSP partner agencies such as the Department of Public Safety's Office of Traffic Safety, the Nevada Highway Patrol, the two major Regional Transportation Commissions (RTCs) in the state, as well as FHWA and the Federal Motor Carrier Safety Administration (FMCSA). NECTS provides guidance on agency plans and programs to ensure that safety remains a top priority. NECTS receives support from a technical working group which is responsible for reviewing the progress of teams assigned to each of the SHSP critical emphasis areas and revising the SHSP. The critical emphasis area teams in turn assist with implementation of multi-disciplinary goals and strategies to reduce traffic fatalities and serious injury crashes. Louisiana's SHSP defines safety priorities and sets measurable objectives for the State. The overarching goal of Louisiana's SHSP is to reduce fatalities to zero. Louisiana has also set an interim goal of cutting fatalities and serious injury crashes in half by 2030. LA DOTD is striving to involve the entire State population because State agencies operating alone won't be able to achieve these ambitious goals. SHSP goals are set with local stakeholder input, through safety summits and other venues. LA DOTD works with MPOs to identify safety goals, objectives and performance measures and linkage to SHSP safety goals. SHSP emphasis area teams have members from local agencies and they help establish and track goals. Collaboration has led to “Joining Forces,” a cross-jurisdictional law enforcement effort where agencies team up for high visibility enforcement campaigns. An RTC representative sits on the Nevada SHSP team. 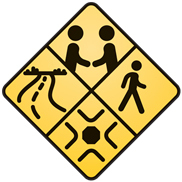 RTP pedestrian and intersection safety goals and performance measures align with those emphasis areas of the Nevada SHSP. The SHSP implementation team determines emphasis areas and performance measures and sets measurable goals for fatalities and serious injury crashes in each of the four emphasis areas. For example, the SHSP set a goal for alcohol-related driving and assigned lead agencies (LA DOTD, Louisiana State Police, and Louisiana Highway Safety Council) to implement the related strategies and track progress. The draft goals are submitted for review by stakeholders, who are invited to review data and provide feedback. Progress toward SHSP goals is tracked quarterly and annually. LA DOTD hosts a safety summit every other year to discuss safety goals and data. In addition, LA DOTD is encouraging MPOs to identify safety goals, objectives and performance measures in their LRTPs. For example, the LA DOTD is giving presentations to the MPOs and the planning council on the SHSP to encourage MPOS to set safety goals that align with the goals of the SHSP. Nevada DOT is focused on improving collaboration with local agencies through critical emphasis area teams, RSAs, and cross-jurisdictional, high-visibility law enforcement campaigns. Critical emphasis area teams include members from local agencies and are responsible for establishing goals in each emphasis area and supporting the implementation of strategies and track progress. Another way Nevada engages local agencies is through RSAs. Nevada DOT has conducted approximately 150 RSAs on State and local roads. To conduct RSAs, NDOT identifies high crash locations and invites stakeholders to participate. RSAs are typically conducted during the scoping of safety projects. NDOT usually hires consultants to lead the RSAs and provide recommendations to the design team. NDOT funds and monitors implementation of the recommendations stemming from RSAs. NDOT plans to do before/after studies on implemented improvements to develop and calibrate crash modification factors. NDOT is now expanding the use of RSAs to support work zone safety and corridor studies. Nevada also has a successful “Joining Forces” effort. This is a cross-jurisdictional law enforcement effort where agencies team up for high visibility enforcement (HVE) campaigns. The HVE campaigns are funded by OTS and DOT and have enjoyed considerable success in the State. The Regional Transportation Commission (RTC) of Washoe County serves as the county's MPO and transit service provider and is responsible for traffic management systems, as well as roadway design, construction, and maintenance services. The RTC sits on the SHSP team and the SHSP is integrated into the 2035 Regional Transportation Plan (RTP). The RTP has a chapter related to the goal of improving safety which aligns with the SHSP critical emphasis areas of Pedestrians and Intersections and states the vision of Zero Fatalities. The RTP also includes a number of safety performance measures that are consistent with the SHSP. The RTP explains strategies to achieve the goal of improving safety, including the use of RSAs and complete streets projects. Finally, the RTP includes safety factors in the project selection process. LA DOTD works with Louisiana LTAP to provide local agencies access to local crash data. Louisiana has published a publicly-accessible online SHSP reporting dashboard. LA DOTD uses crash data to allocate limited funds, target high crash locations, identify low cost systematic counter measures, and inform the public. Louisiana State University manages a crash data repository and is developing internet sites to access crash data and analysis. LA DOTD uses an application called CRASH1 to interface with crash data and provide access to our partners. Users can run queries of Louisiana's crash databases. Louisiana LTAP and local agencies can access to local crash data through a separate interface called CRASH3. CRASH3 provides the roadway name and intersecting street rather than latitude and longitude of the crash location. Crash data reports are publicly available through the internet (http://datareports.lsu.edu/). LA DOTD does not publish location-specific data, but queries of the system can show crash data at the Parish and Municipality level. Finally, LA DOTD produces SHSP reports that are publicly available (http://lashspdata.lsu.edu). These reports identify emphasis areas and report progress. The interface provides a number of ways to query and analyze the available data. Louisiana's crash data have limitations that LADOT is working hard to address. LA DOTD has identified common coding errors and seeks to validate all crash locations and provide training to law enforcement to improve crash reporting. Louisiana DOTD is also working through the Traffic Records Coordinating Committee to improve the rate of electronic crash reporting and provide hardware and software to local law enforcement. NDOT is currently modernizing its data program by working with law enforcement to improve the quality and timeliness of crash data. NDOT is also working to make crash data and data analysis more accessible to regional and local agencies. Currently, NDOT uses crash data to prioritize high-crash intersections. NDOT is working with local agencies to identify high crash locations and develop treatment proposals. UDOT has assessed the safety risk of State-owned road segments based on crash data and created color-coded risk maps that are available online. UDOT's goal is to provide analytical tools and training to MPOs to allow them to screen HSIP projects in their regions. Currently, UDOT collects and evaluates crash, roadway and traffic data through UDOT's Central Office with input from four Regional Offices. The Central Office is ultimately responsible for identifying and scoping HSIP projects. To analyze projects for HSIP eligibility UDOT prepares three years of crash histories, identifies crash characteristics and potential mitigation measures, and develops benefit cost ratios. UDOT has assessed the safety risk of State-owned road segments based on crash data and created color-coded risk maps that are available online at http://uplan.maps.arcgis.com/home. This process helps UDOT determine where the problem areas are and target HSIP projects. HSIP-funded projects are prioritized based on their ability to reduce fatal and serious injury crashes, using a benefit-cost ratio. UDOT also considers the project completion timeline to understand how quickly the benefit will accrue and to assess whether the project can be coordinated with other projects to get maximum benefit from all funding sources. To track the results of the HSIP program and better assess safety projects, UDOT is preparing 3-year before/after crash histories for some HSIP projects. UDOT is developing a three-year program of HSIP projects that anticipates funding in out years. This will allow UDOT regions to move projects ahead or back to coordinate with other projects and helps UDOT demonstrate to stakeholders that safety issues will be addressed in the near future if not immediately. MPOs are responsible for a significant portion of Utah's roads and UDOT is working to engage MPOs in the HSIP project identification and selection process. UDOT has created and made available to MPOs county-wide heat maps showing crash frequencies and safety risk ratings of road segments. UDOT uses a model developed by Brigham Young University and road data collected through a LiDAR-based system to create a statistical analysis of safety risk. UDOT is working to expand this approach beyond State roads to local and MPO roads. In the future, UDOT will focus on State routes and MPOs will focus on non-State Federal-Aid routes. UDOT is inviting MPOs to participate in the HSIP process by soliciting applications from municipalities. UDOT's goal is to build the capacity of MPOs by providing them with analytical tools to screen and prioritize potential HSIP projects in their respective regions. Through the unified planning work program, RTC is developing a Southern Nevada Transportation Safety Plan to tailor SHSP to the needs of Southern Nevada. RTC is working with NDOT to channel HSIP funding through MPO process. The South Nevada Regional Transportation Council (RTC) is the transit authority, traffic management systems, and transportation planning agency, as well as roadway design, construction, and maintenance services. The RTC General Manager serves on NECTS and participates on the Nevada Traffic Records Coordinating Committee. RTC has developed a pedestrian safety action plan for Las Vegas and is implementing many of the strategies described in the plan. For example, the RTC recently adopted Complete Street guidance. In addition, RTC is funding a number of studies to identify projects for bicycle improvements which will feed into the transportation planning progress. Through the unified planning work program, RTC is developing a Southern Nevada Transportation Safety Plan. RTC is working with NDOT to integrate HSIP funding in the MPO project selection process. RTC is also working with NDOT developing a web-based interface to analyze safety improvements. LA DOTD is working closely with Regional Safety Alliances to track progress in implementing Regional Safety Plans and achieving safety goals. Louisiana holds regular meetings to coordinate the monitoring and evaluation of the SHSP among stakeholders. LADOTD provides data to all of the Regional Safety Alliances annually and they recently hired a coordinator to organize meetings, take notes, distribute information, and track progress towards goals. LA DOTD has developed a simple Excel-based tracking tool for tracking progress towards SHSP goals and implementation of SHSP strategies. The tool allows users to track actions developed to achieve strategies in each emphasis area. Regional Safety Alliances commit team members to collect implementation data. If data are not available, LA DOTD encourages stakeholders to develop a data collection plan. LA DOTD uses the data collected by Regional Safety Alliances to track SHSP implementation at the regional level and develops an annual report describing progress toward SHSP goals. The table below highlights some of the most noteworthy safety planning coordination practices participants raised at the Peer Exchange. Nevada Strategic Communications Alliance Established a strategic communications alliance to streamline and coordinate SHSP marketing campaigns and assist local agencies with SHSP-related media events. Louisiana Regional Safety Alliances DOTD provides assistance to Regional Safety Alliances that develop regional safety plans aligned to the SHSP and conduct local outreach efforts. Utah, Nevada and Louisiana SHSP/LRTP Integration Utah, Nevada, and Louisiana have all set versions of the goal “Towards Zero Deaths” and use this goal to motivate stakeholders to commit to safety goals and strategies. Utah Unified Transportation Planning Process Utah's Unified Transportation Planning process ensures that the State DOT and MPOs use the same crash data, forecasting assumptions and analysis methodologies. Louisiana SHSP Progress Reports LA DOTD produces SHSP reports that are publicly available (http://lashspdata.lsu.edu). These reports identify emphasis areas and report progress. The interface provides a number of ways to query and analyze the available data. Louisiana Data Audits Louisiana plans to conduct an audit of available data to assess the quality and timeliness of data sources and improve the coordination of data analysis. Louisiana and Utah Online Data Analysis Tools Louisiana and Utah provide access to crash data to regional and local agencies through online crash analysis tools. Utah MPO Screening of HSIP Projects Utah DOT is working with MPOs to integrate them into the HSIP project selection process. MPOs will review and prioritize HSIP applications in their respective regions. Louisiana Tracking Tools Louisiana DOTD created a simple Excel-based tracking tool to track implementation of strategies and progress towards goals at the State and Regional levels. After the peer presentations, the peers were broken up into smaller groups by State. The purpose was to have the State and regional representatives explore strategies to improve regional and statewide coordination safety efforts that they can pursue in their respective States, actions they will take, the resources they will need and the Champion for that strategy/action. Below is a brief description of the small group discussions. Coordinating more with MPOs by providing county level crash reports to MPOs. Running the HSIP project selection process through MPOs to evaluate local roads. Using the unified transportation planning process in Utah to develop safety performance measures and targets collectively to ensure consistency. In the action planning breakouts, Utah developed more specific strategies and actions, and identified the needed resources and Champion(s) to help them achieve their strategies. In the first breakout group, Nevada stakeholders expressed an interest in improving coordination and collaboration among MPOs and NDOT. To increase MPO involvement in the safety project selection process, NDOT plans to document clear criteria for HSIP project ranking and establish a process for applying project funds through NDOT. Nevada will use the SHSP as an umbrella plan to promote the development of local and regional safety plans that establish regional safety goals and objectives tailored to local and regional needs. In the action planning breakouts, Nevada developed more specific strategies and actions, and identified the needed resources and Champion(s) to help them achieve their strategies. In the first breakout group, Louisiana discussed establishing a communications alliance. Louisiana wants to bring data to decision makers and engage stakeholders beyond traditional transportation stakeholders. They want to identify champions at the regional level. Louisiana is also interested in forming a safety advisory council at the MPO-level. Data analysis is needed at the regional level. Louisiana is also interested in using Road Safety Audits (RSAs). They want to adopt regional safety plan into long range transportation plan as well as the SHSP. These would be under the purview of the regional safety committee. Finally, Louisiana safety stakeholders would like to develop ways to evaluate performance common to both the State and regional level. They plan to develop a common evaluation process for candidate projects and coordinate how data is used at all levels. In the action planning breakouts, Louisiana developed specific strategies and actions, and identified the needed resources and champions to help them achieve their strategies. Improving the coordination and linkage between SHSPs and transportation planning documents, notably Statewide and Metropolitan LRTPs, is a critical element of a comprehensive and holistic approach to transportation safety planning. As States adopt aggressive safety goals, such as Towards Zero Deaths, many are searching for new ways to address safety issues across all elements of their transportation network. The States of Nevada, Louisiana, and Utah are committed to improving highway safety by establishing consistent data-driven State and regional transportation planning processes that integrate safety as a critical priority and are clearly linked to the SHSP. Representatives from each of these States shared the practices they found to work best to integrate safety into planning, such as setting clear and aggressive safety goals, making quality safety data readily accessible, coordinating safety project selection and funding processes, and closely monitoring progress towards safety goals. State representatives were able to learn from the differences in their approaches to integrating safety into transportation planning and incorporated many “borrowed” ideas into their action plans for their respective States. The passion and enthusiasm of the representatives at the peer exchange was infectious and all participants took advantage of the opportunity to learn from their peers in other States and to plan their next steps with peers from their own States. Goal of Peer Exchange: This peer exchange will be held with the States of Louisiana, Nevada, and Utah. The goal is for the states to share successful practices and opportunities for coordinating state and regional safety planning efforts through the SHSP and other safety planning processes. Strategy 1: Establish regional goals and objectives that meet regional needs and support SHSP goals and objectives. Action 1.1: Determine which emphasis areas, strategies and goals are applicable from the SHSP. Action 1.2: Tie in regional goals to the project selection process. Strategy 2: Coordinate RTP and SHSP performance measures. Action 2.1: Continue alignment of performance measures and adjust them based on MAP-21 Guidance. Action 2.2: Include discussion of performance measures in County tours. Strategy 3: Update/Reinstate CARE database/analysis tool and use the system to provide crash data to locals to monitor system. Action 3.1: Establish agreement with RTC Washoe and Southern Nevada to pay for it. Action 3.2: Track usage and identify opportunities for improving system. Strategy 4: Identify opportunities to work with MPOs and locals to share safety studies and augment data analysis (particularly with bicycle/pedestrian data). Action 4.1: Present analyses to RTC Board and State Transportation Technical Assistance Committee. Action 4.2: Check on scope of current and future studies to see if there is an opportunity to add a safety element. Action 4.3: Consider amending the SHSP to include “vulnerable users” emphasis areas. Strategy 5: Enhance local participation in safety project selection processes. Action 5.1: Develop and document project ranking methodology. Action 5.2: Establish process for applying for HSIP funds. Action 5.3: Train locals and implement process. Strategy 1: UDOT will engage MPOs through presentations and reports to technical and policy committees. Action 1.1: Identify Zero Death champions on MPO Committees. Action 1.2: Provide regular safety status reports to MPO Committees. Action 1.3: Provide comprehensive in-person briefings to MPOs on an annual basis. Action 1.4: Develop MPO-specific crash dashboards. Strategy 2: Use unified planning process to engage MPOs in developing consistent performance targets and project prioritization methodologies. Action 2.1: Ensure MPOs develop comprehensive safety sections in their Long Range Transportation Plans that outline safety responsibilities and strategies. Action 2.2: Engage MPOs in setting statewide and MPO-level targets for safety as required by MAP-21. Action 2.3: UDOT will develop proposed processes for establishing metrics and targets. Strategy 3: Ensure MPOs are using the same crash data, forecasting assumptions and analysis methodologies. Action 3.1: Document process UDOT is using to complete crash data analysis. Action 3.2: Evaluate MPO capacity to implement process. Action 3.3: Identify strategies to address gaps in MPO capacity. Strategy 4: Engage MPOs in HSIP project selection process. Action 4.1: Modify existing statewide HSIP project selection process to be applicable at regional level. Action 4.2: Determine capacity of MPOs to manage MPO HSIP process and analyze projects. Action 4.3: Pilot the process with one MPO. Action 4.4: Ensure MPOs implement the process or, where necessary, provide resources to implement process. Strategy 1. Improve stakeholder coordination and collaboration. Action 1.1: Implement a communication alliance. Action 1.2: Ensure safety is considered during updates of transportation plans. Action 1.3: Coordinate performance management. Strategy 2. Develop a system of coordinated data and analysis. Action 2.1: Place an MPO representative on Traffic Records Coordinating Committee. Action 2.2: Audit what data are available and how they can be used. Action 2.3: Research whether it is feasible to acquire medical records from emergency responders and hospitals. Action 2.4: Develop a strategic data business plan. Action 2.5: Ask NHTSA to help develop strategic plan for traffic records. Action 2.6: Document and provide training on the use of available data. Action 2.7: Start a user work group to determine user requirements. Strategy 3. Develop a coordinated safety project selection process. Action 3.1: Use safety summits around the State to provide training for MPOs on project selection processes at planning association meeting. Action 3.2: Define the role of the MPOs and regional Alliances in project selection process. Strategy 4. Develop a coordinated monitoring and evaluation process. Action 4.1: Tie monitoring and evaluation into strategic data business plan. Action 4.2: Develop an evaluation plan and make results available to stakeholders.